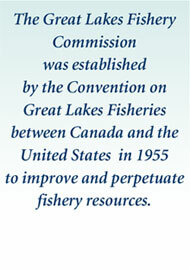 Under the Great Lakes Fishery Commission's sea lamprey control program, traditional funnel traps (Figure 1) have been used for decades as a sea lamprey control method. While effective at trapping sea lampreys during their upstream migration to spawn, funnel traps are also known to trap fin-fish in the process, requiring additional labor to sort non-target fish. However, with the recent development of new sea lamprey trapping technology, natural resource managers have a new tool to aid in sea lamprey control while protecting desirable fish. 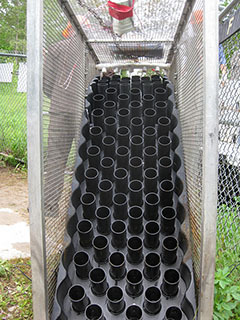 One new sea lamprey trap design, called an "eel-ladder style trap" (ELST), is one of the first lamprey-specific traps to be developed anywhere in the world (Figure 2). The Commission's Pete Hrodey has partnered with Ulrich Reinhardt of Eastern Michigan University and Scott Miehls of the U.S. Geological Survey - Hammond Bay Biological Station to evaluate this new style of trap. In the four years since the project's inception, the team had led two different studies analyzing the effectiveness of ELSTs in comparison with traditional funnel traps and determining trap characteristics that lead to the most captures. Inspiration for new trap designs has come from a logical source: eel ladders. Although sea lampreys and eels are not related biologically, they do share many characteristics related to motion and migration. For instance, neither eels nor lampreys are jumping fish, rather, they "snake" their way past obstacles. The key to the ELST is its unique ramp design that allows sea lamprey to pass, but not fin-fish. 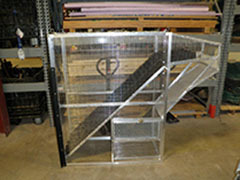 The ramp forms the entrance to the trap, and looks like a pegged slide enclosed in a cage. In contrast to traditional funnel traps, which are submerged in water, the ramp of the ELST protrudes partially out of the water on an angle, requiring fish to climb the ramp. A trickle of water from the top of the ramp wets the surface and entices fish to the ramp, but the water is not deep enough for fish to swim. Sea lamprey, which move using an eel-like (anguilliform) motion, use the pegs on the ramp to push upward, eventually slithering their way to the top and finally falling into a collection cage a few feet below the top of the ramp (Figures 3 and 4). Fin-fish, on the other hand, cannot propel themselves around the numerous, closely spaced pegs on the ramp, and are thereby blocked from climbing. Thus far, the ELSTs have proven extremely effective in retaining captured sea lampreys, demonstrating 100% retention capabilities during field tests conducted by the team on the Ocqueoc, Cheboygan, and Brule Rivers. Additionally, unlike traditional funnel traps, ELSTs are successful in excluding fin-fish, which reduces time spent sorting by-catch. ELSTs could also reduce labor demands, since their design reduces frequency of trap checks from daily to a few visits per week. Even with these successes, sorting and retaining sea lampreys is only half the battle. The other half is luring sea lampreys to the ELST in the first place, and then ensuring the ramp is designed so that sea lampreys can successfully climb the ramp. Current research led by Hrodey, Reinhardt, and Miehls is analyzing sea lamprey entry into ELSTs and passage success rates in hopes of achieving rates greater than those of traditional funnel traps. To find the most attractive climbing scenario for sea lampreys, the team is studying how ramp angle, flow rate, and pheromones (attractive scent) affect climbing behavior. The team also plans to complete additional studies on selective fish passage with Drs. Michael Wagner and John Hume of Michigan State University, and Dr. Martyn Lucas of Durham University in the United Kingdom. Given their perfect selectivity and retention, Hrodey envisions ELSTs as tools to support other assessment and control techniques. 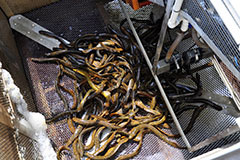 "Eel-ladder style traps are going be useful for the control program," said Hrodey. "They give us another tool in our tool box that will likely be far superior to traditional funnel traps. When you combine the performance with potential gains in operator efficiency and safety, ELSTs may represent the future of trapping for control." Using the integrated pest management approach, Hrodey sees ELSTs as best deployed when integrated with other control techniques such as physical and non-physical barriers and other trap types. By incorporating ELSTs into fish passage systems under the Commission's control program, sea lamprey access to Great Lakes tributaries can be further prevented while ensuring selective passage of desired fish species. A traditional funnel trap used to trap upstream migrating sea lampreys. 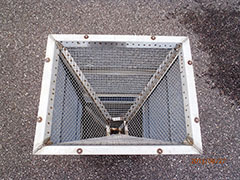 Figure 2: An eel-style ladder trap developed by researchers studying their effectiveness. This trap was deployed in the Ocequeoc River, which served as one of three trial locations for the traps. Figures 3 and 4: Sea lampreys climb the eel-ladder style traps by wiggling in a serpentine motion up the plastic pegs (TOP). Upon making the ascent, the sea lampreys are captured in a caged area on the reverse side of the trap.